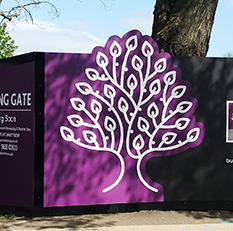 These signs are made from composite aluminium, which results in a very rigid yet lightweight, hard wearing flat sign. They are very temperature stable and offer great resistance to physical impact. Commonly used for shop fascias, wall signs, information panels or directional signage in museums, car parks, hospitals, residential developments, educational facilities etc. they can be fixed to posts, drilled, screwed or nailed to walls. Dibond signs are ideal for indoor or outdoor use, and because they are made of aluminium, they are rust proof so will continue to look great for years. Your design will be printed directly onto the sign with UV inks at 1400dpi photographic quality, which gives a stunning professional finish.